The Shema Prayer is perhaps the most important prayer in Judaism. This prayer affirms our belief in one Almighty God. Although God reveals Himself in many ways, we know that this is a result of His many attributes, not that there is more than One. There are entire books written about this one prayer. It is easier to understand God if we think about it as though we are looking through a prism or a diamond. The light that we normally see from the sun is colorless or “pure white”. When we look through a prism we realize that it is actually made up of many different colors. Much of the spectrum of infrared or ultraviolet light we cannot see with our human eyes. Nevertheless the many colors are there, just as God’s many manifestations are truly one and the same. The Shema prayer is made up of two paragraphs, the first two of which are contained in every kosher mezuzah. These and two other paragraphs of the Torah from Exodus are contained in every set of kosher tefillin. The third paragraph of the Shema is is recited so that we remember the Exodus from Egypt, as we do on Passover. When God freed the Jewish People from slavery, he laid claim to our eternal allegiance. According to Rashi, (Rabbi Shlomo Yitzchaki or Rabbi Solomon Isaac) no Jew is free to remove themselves from this obligation to acknowledge and serve HaShem. Reciting the Shema in the morning and at night is one of The 613 Mitzvot. The third paragraph of the Shema explains that we are to follow all of the mitzvot, not to pick and choose between them. This is fundamental in Judaism. Just do the best that you can, and HaShem will help you the rest of the way. The Mitzvah Project have selected the Shema and especially the third paragraph for a special reason. We realize that we cannot perform all 613 Mitzvot at this time. This does not in any way, shape, or form, mean that they are not binding any more. They are still binding on every Jew. Of course as we have explained before, men and women have some mitzvahs that apply only to each other. Some of the mitzvahs are rarely performed, and some of them apply only in the Land of Israel. We know this, however if we study those we cannot do, HaShem will reward us as if we actually obeyed them. It is much better for a person to be truthful with God and just admit that they are sorry that they can’t do a certain mitzvah right now. He does not expect a person to change overnight. Before we list the three paragraphs of the Shema there are two very important things you must know. The first one is that before you study of recite any verses of the Torah, you must recite the Bircas HaTorah or Blessings of the Torah. Because the mitzvah to study is in effect all day, these blessings need not be repeated if you study at various times of the day. The prayer is generally written as follows: “Blessed are You, HaShem our God, King of the Universe, Who has sanctified us with His mitzvahs and has instructed us to engross ourselves in the words of Torah”. Please refer to the ArtScroll prayer book for a greater explanation of these blessings. We ask you read the section of The Mitzvah Project regarding our recommended reading list and buy one of these books. There are other recommended siddurim (prayer books) listed as well. We suggest the ArtScroll siddur in addition to any other prayer book you currently use because the commentary is excellent. We do not advise you replace your current prayer book necessarily, and we use and refer to many different siddurim. This blessing is extremely important. The Talmud (part of the Oral Law) explains that not reciting these blessings before reciting Torah passages has caused much suffering for Jewish people over the years. When we bless God we do not mean that we are adding anything to His powers or possessions. Our blessings constitute our declaration and belief that He is the source of all blessings. According to Rabbi Hirsch, it represents our dedication to allow His will to be fulfilled by our obedience to His mitzvahs. By blessing God we are accepting the fact that it is within our power to accomplish His goals for humanity. The second most important thing we want you to understand is that we want World Peace. We do not want to cause arguments within the Jewish community, or in any community for that matter. We accept all Jews, regardless of their level of observance of the mitzvot. Some Jews do not accept The Thirteen Principles of Faith as set down by Maimonidies. Please refer to this section of The Mitzvah Project. Many people do not accept that the Oral and Written Torah was given to Moses by HaShem, during the time of the wandering in the desert. While we find this distressing, we have not found any Jews who disagree that there are 613 Mitzvot. There are different opinions as to what the 613 Mitzvot are, however it is our experience that every Jew who knows about the Torah agrees that there are 613 of them. We agree that all Jews have to get along and live together happily, safely, and peacefully. We wholeheartedly agree with the mitzvah to “Love your fellow as yourself.” We also agree that Jews should worship God in the way that they feel most comfortable and at ease. We do not expect all Jews to pray to God in the same way, this is not what God expects of us. Every one of us is unique, and we all have special talents of our own. Just as each tribe had their own special talents and skills, we each have things to share with each other. We must respect and embrace these individual skills and learn from them. Each Jew that was counted brought a half-shekel coin only, because without each other we are only half of the whole picture. It is a positive mitzvah to recite the first two paragraphs of the Shema every evening and every morning. Please recite the Blessings of the Torah before reading the Shema, or before any other section of Torah. Of course men are supposed to put on a tallis and tefillin first, and there are appropriate blessings to recite before doing these mitzvahs as well. The prayer books go into the order of the services including the washing of the hands, and preliminary prayers, so we will not repeat them here. Hear, O Israel: HaShem is our God, HaShem, the One and Only. The more commonly written translation of the Shema is: Hear, O Israel: The Lord our God, The Lord is One. The word Shema in Hebrew also means “understand” as well as “hear”. This verse is generally followed by a short prayer said in an undertone: Blessed is the Name of His glorious kingdom for all eternity. According to Philip Birnbaum, God bless his soul, this prayer should actually be translated as: Blessed is The Name of His Glorious Majesty for all eternity, or Blessed is His Name, His Glorious Majesty is for all eternity. Another version is Bless the Glorious Name of His Kingship for all eternity. According to the Great Rabbi’s or Sages of Talmudic times, there are two reasons why this verse is said quietly. The first reason is that when Jacob was on his deathbed, he asked his children who they would pray to after he passed away. His children responded by reciting the Shema. The word Israel also refers to Jacob in this context, as Jacob was given this additional name by HaShem. Jacob then responded with this verse. According to Pesachim 56a, we recite them because Jacob did say this, however they are not found in the Written Torah so we say them quietly. The second explanation is that Moses heard these words from the angels, and then taught them to the Children of Israel. According to Devarim Rabbah 2:36, on Yom Kippur we elevate ourselves to the sin-free level of angels, and then we are free to say it out loud. In any case, it is certainly a beautiful prayer. When reciting the first full paragraph of the Shema we should concentrate on the mitzvah to love God. You shall love HaShem your God, with all your heart, with all your soul, and with all your resources. Let these matters that I instruct you today be upon your heart. Teach them thoroughly to your children, and speak of them while you sit in your home, while you walk on the way, when you retire and when you arise. Bind them for a sign upon your arm, and let them be tefillin between your eyes. And write them on the doorposts of your house and upon your gates. When reciting the second paragraph you should concentrate on accepting all the mitzvahs, and the concept of reward and punishment. And it will come to pass, that if you continually hearken to My mitzvahs that I instruct you today, to love HaShem your God, and to serve Him with all your heart and with all your soul – then I will provide rain for your land in its proper time, the early and the late rains, that you may gather in your grain, your wine, and your oil. I will provide grass in your fields for your cattle, and you will eat and be satisfied. Beware lest your heart be seduced and you turn astray and serve gods of others and bow to them. Then the wrath of HaShem will blaze against you. He will restrain the heaven so there will be no rain, and the ground will not yield its produce. And you will swiftly be banished from the goodly land which HaShem gives you. Place these words of Mine upon your heart and upon your soul; bind them for a sign upon your arm and let them be tefillin between your eyes. Teach them to your children, to discuss them, while you sit in your home, while you walk on the way, when you retire and when you arise. And write them on the doorposts of your house and upon your gates. In order to prolong your days and the days of your children upon the ground that HaShem has sworn to your ancestors to give them, like the days of the heaven on the earth. When reciting the third paragraph you should remember to perform or refrain from all 613 Mitzvot. Performing this is an additional positive mitzvah which is to remember the events of the Exodus every day. And HaShem said to Moses saying: Speak to the Children of Israel and say to them that they are to make themselves tzitzis on the corners of their garments, throughout their generations. And they are to place upon the tzitzis of each corner a thread of techeiles. And it shall constitute tzitzis for you, that you may see it and remember all the mitzvahs of HaShem and perform them; and not explore after your heart, and after your eyes, after which you stray. So that you may remember and perform all My mitzvahs; and be holy to your God. I am HaShem, your God, Who has removed you from the land of Egypt to be a God to you. I am HaShem your God – it is true – HaShem, your God, is true. The last words of the third paragraph “it is true” are actually part of the next verses of prayer, and the words “HaShem, your God, is true” are generally recited in a synagogue by the Chazzan or Cantor. We have included them here because it is customary to say them, and many prayer books have it written this way. The first paragraph is where we get the mitzvahs of tefillin on the arm and on the head, and the mitzvah of putting up a mezuzah. Some people put up a mezuzah on every doorpost of their home, except the bathroom doorposts. If you do not have a mezuzah on the front door of your home, find out about buying a kosher one and how to install it properly. There is a special berachah (blessing) to say before you install it. This mitzvah will bring much happiness and success, as well as an unlimited amount of blessings to you, your family, and all those who enter your home. It will usually relieve you and your family of any nightmares or bad dreams as well. Please make sure the parchment and the script is checked by a scribe every so often as well. Sometimes the letters are touching one another, and for some reason every now and then the mezuzahs need to be corrected. The third paragraph is where we get the mitzvah of tzitzis or fringes. The Hebrew word tzitzis has the numerical value of 600, and the five knots and eight strings or fringes add up to thirteen. By wearing a tallis or tallis kattan (a small tallis generally worn under the shirt), we wrap ourselves in all 613 Mitzvot. The tallis or tallit is classified as a time-related mitzvah, and is therefore not required of women. Reciting the Shema twice a day, and wearing tefillin is also not incumbent on women. Tzitzis do not have to be worn at night, however some men do, and some men even sleep with them on. The large tallis is usually only worn during the morning prayers known as Shacharis or Shacharit. Some congregations do have a custom of wearing the tallis on Friday evenings when we welcome the Sabbath Queen or Sabbath Bride. There are different customs regarding the large tallis. Eastern European or Ashkenazic Jews usually do not wear a large tallis until they get married. Sephardic Jews, who are mainly from Spanish, German, or Middle Eastern descent, wear tallit even as children. Some Jews have parents from both Ashkenazic and Sephardic lineage, and they may or may not wear a tallis during Shacharis. In either case it is a mitzvah to wear the small undershirt or tallis kattan every day. Some men wear the tzitzis outside their shirts, and some wear them tucked in their pants. The thread of techeiles referred to in the third paragraph is subject of much discussion today. Techeiles is a blue dye that comes from a creature known as a chilazon. The longest thread of the tzitzis is supposed to be dyed with this blue color. There are some people who say that it is also acceptable to wrap a woolen thread dyed with techeiles around the longest fringe. For many centuries this dye has been unavailable and only the white threads have been used. Please see the recommended reading list for a web site regarding techeiles. The reason we wear tzitzis is because it is a mitzvah. We are to look at the techeiles thread so that we remember the 613 Mitzvot and do them. Just to study the Torahs and not obey the mitzvahs is not enough. We believe that the techeiles threads are available today, however they are not universally accepted at this time. In any case the tzitzis are only a reminder of what we must do in order to bring World Peace. We recommend that all Jewish men attend a minyan every morning and every night if possible. Of course it takes time for a person who is not accustomed to doing this to make it a habit. We ask you to study the Oral and Written Torahs, especially the Midrash books we suggest in our reading list. You should check everything out for yourselves, and ask as many questions as you need to in order to feel confident that you have the correct answers. You will find that sometimes there is more than one opinion about certain issues and topics. Please find Rabbi’s or Torah Scholars you feel comfortable learning with, and by all means join a synagogue and pitch in. The Mitzvah Project is a great way to begin learning about HaShem and His Torahs. Start by reciting the Blessings of the Torah and then the Shema. 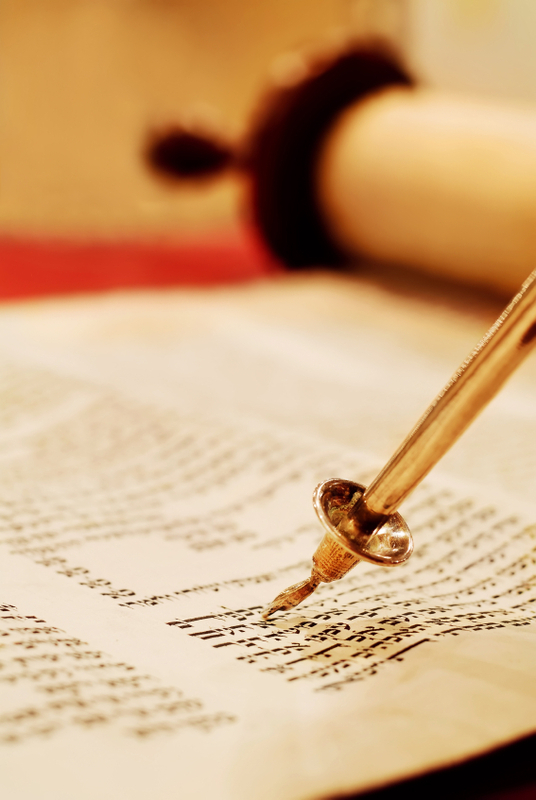 Studying the Torah is a huge mitzvah, and soon you will find yourself drawn to it quite naturally. Learn at your own pace, and don’t let others stop you from becoming a more intelligent, kinder, and more peaceful person. Together by studying the Torahs and doing or refraining from the mitzvahs we will make the world a better place. Thank you in advance, and lets all pull together to bring true World Peace. Shalom and Baruch HaShem! Send mail to Jay@TheMitzvahProject.org with questions or comments about this web site. You will enjoy doing mitzvahs, and the good feeling you get by doing them. Our "connection" to God and to each other is our greatest asset. We must use it wisely. Shalom (Peace) to you and yours, now and forever.